Introducing this chicken rice that i had been visiting since my schooling days – Delicious Boneless Chicken Rice at Katong Shopping Centre. 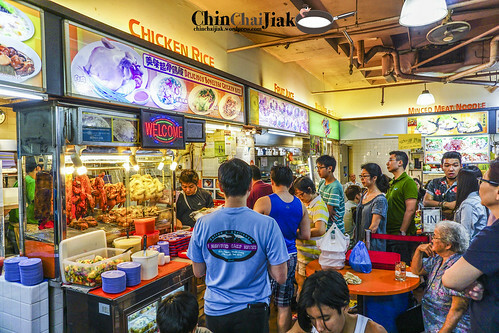 There are many things to do at Katong Shopping Centre then – LAN gaming, Billiard and Pool, Bowling and Karaoke and this chicken rice is my must-eat whenever i visit this place. Price wise, it’s actually a little more pricey than the usual. Be prepare to spend about $6 to $10 per person, depending on what you order. For this meal, it costs me $54 (enough for six pax) and it comes with half roasted chicken, half steamed chicken, braised pork belly (seasonal), bean sprout with sliced abalone and two big bowl of (refillable) soup that are filled with meat and vegetables. Did I mention that it also comes with free flow achar? The chicken is well roasted, with the skin slightly crisp, and drenched in a good serving of their unique blend of base sauce that is made from soy sauce and sesame oil. It’s completed by sprinkling fried garlic bit on the chicken, which added a tinge of garlicky fragrance to the chicken. Some may find the sauce a little too salty but i thought it complements the chicken perfectly and made every chunk of chicken enjoyable, including the usually drier breast part. Their steamed chicken does not stand pale in comparison than it’s roasted counterpart. They manage to retain the natural sweetness of the chicken while ensuring the meat is succulent and juicy. Apart from the chicken, the thick-cut crunchy cucumber slices that are soaked in this sauce is definitely the next best thing that can happen to this plate of chicken. If there is one thing to improve on, I guess that it’s their rice. Although I don’t find any major problem with their rice and i actually still like it, I have to highlight that their rice is a little to the dryer side, and comparing to some, it’s not as aromatic and fluffy. This may also means that it’s less oily. The next unique thing about this chicken rice is gotta be their free flow achar and the (refillable) soup that comes with it. 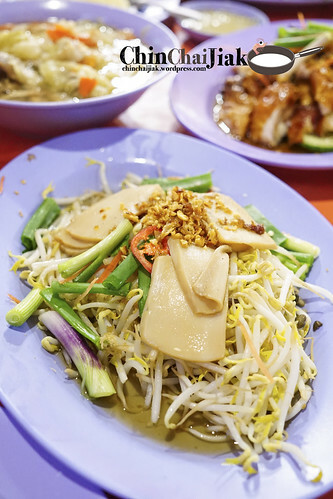 Typically for a portion for four people, it comes with two big bowl of soup – peppery cabbage and pork rib lotus roots. And they are not just soup, but full of vegetables and meat. 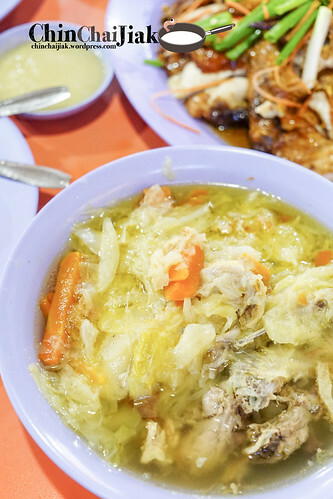 The cabbage soup is cooked in chicken bones and flavoured with pepper. The cabbage is so soft, that it almost just melt in my mouth. 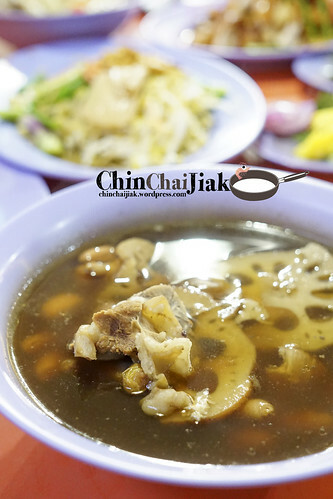 For the lotus roots soup, it comes with a generous amount of thick crunchy lotus roots, peanut, and even comes with chunks of pork rib in it. I’m quite sure these are one of the best “complimentary” (although i think the cost is already factored into the overall price) chicken rice soup. They also serve side dishes like Oyster Sauce Vegetable and Bean Sprout with Sliced Abalone. Yeap. Real sliced abalone. I mentioned earlier that the price of the chicken rice can be a little more pricey and this is why. 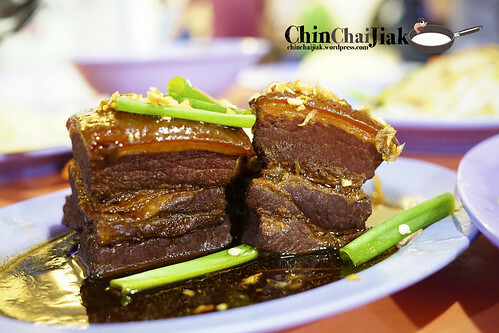 On this visit, the staff recommended us to try their seasonal dish – braised pork belly a.k.a Dong Po Meat (东坡肉) when we wanted to order their roast meat. I though this dish is not bad. I like the fatty portion (the top part of the pork belly). They manage to break down the fat and made it melty soft instead of a rubbery texture but i thought the fatty part is a little too little as most parts are meaty and it is not soft enough and I sort of struggled trying to dissect it. It’s well braised and flavoured, but probably i still prefer my roast meat to go with my chicken rice. It’s always a feast whenever i visit Delicious Boneless Chicken Rice at Katong Shopping Centre and having a meal there has always been satisfying. I like this chicken rice for it’s overall package, and not exactly on the individual dish. 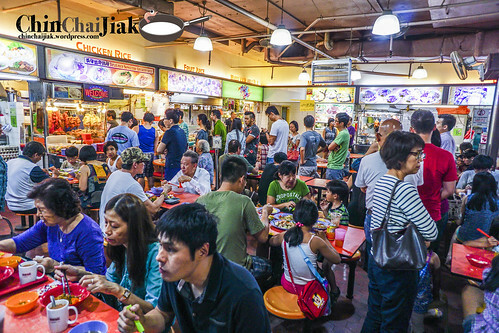 The meal time crowd has been increasing over the years and sometimes it may require a 45 minutes of waiting time, which i personally think that this one factor made the chicken rice not as attractive as before. 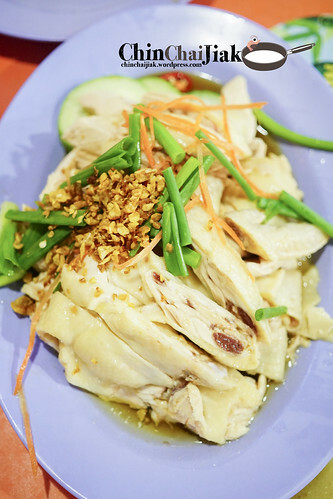 For some people, the location of this chicken rice may also be a turn-off as it’s not exactly easily accessible. 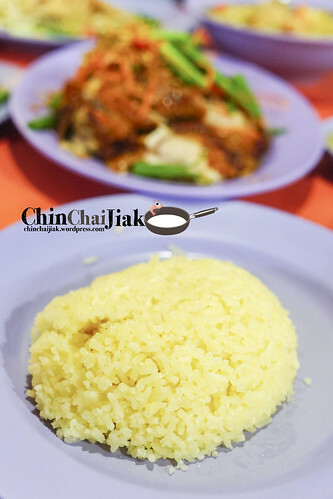 Delicious Boneless Chicken Rice has endured the test of time despite for operating in such an inconspicuous location, and maintained their standard throughout the years while maintaining a still-reasonable price. Until it goes the other direction, i will still come back and visit this place whenever i can. 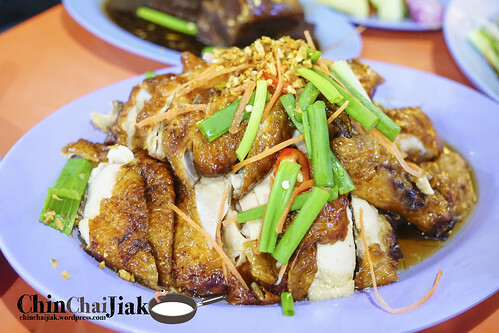 This entry was posted in Dishes - Chicken Rice (Roasted), Dishes - Chicken Rice (Steamed), Good For - Casual Dining, Good For - Cheap Eat, Location - Tanjong Katong, Type - Coffee Shop, Type - Hawker Food and tagged Boneless Chicken Rice, Chicken Rice, Delicious Boneless Chicken Rice, hawker food, Katong Shopping Centre, Parkway Parade, Roast Chicken, Singapore, singapore food, Singapore Hawker, Steamed Chicken, Tanjong Katong. Bookmark the permalink. Personally I find the standard has dropped! 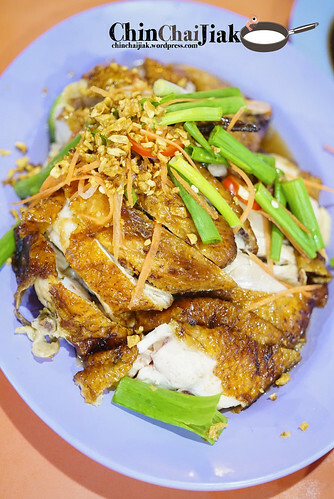 It tastes like any other franchised chicken stalls around Katong! $18 for half a chicken is absurd and ridiculous, only fools will pay for it! !